It is an awesome website that lets users submit recipes (with gorgeous photos)…and I can basically just look through all of the photos for an idea of what to make for dinner! Take a look…you’ll be drooling, too! I found this recipe, and made it yesterday. It is supposedly a “salad”…but I personally thing most dishes like this deserve to be a dip, too. So, out came the tortilla chips…yummy!! It uses avocados, fresh lime juice, and quinoa, which is literally one of the healthiest foods on the planet (and a staple in many South American countries). It’s a shame I only discovered quinoa last summer…and that most people have still never heard of it, or tried it. I would compare it to rice (cooks the same way), but it is lighter, fluffier, and has a light crunch when you eat it. I often mix it with rice in my rice cooker, because I love its high fiber and iron content! You can find it in the health food section of stores, and it looks like a little tiny seed (which it is). Mmmm, I love making this salad!! SOOOOO good on a hot Summer day. 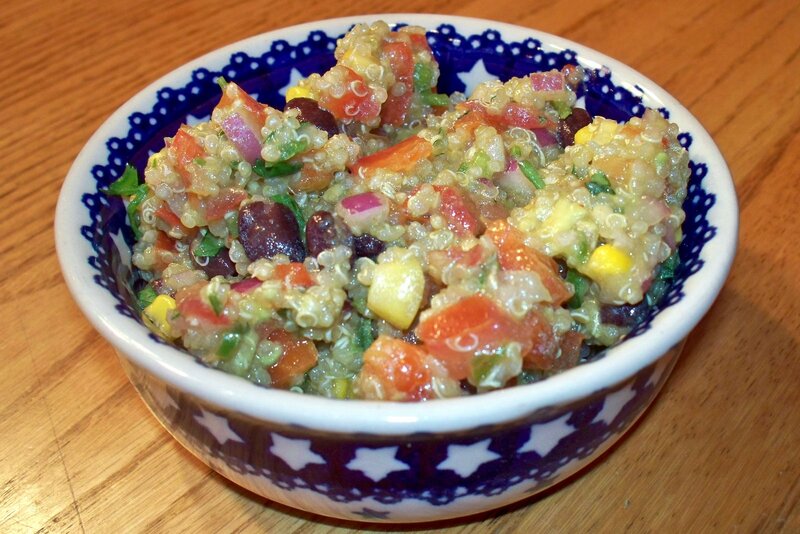 I have been wanting to find a good recipe that uses quinoa, and this one looks delicious! Can't wait to try it!